At The Foam Factory, we provide a broad range of foam cutting services, from computer-controlled cuts made with a powerful stream of water, to hand-crafted cuts made by our team with decades of experience. However, not every project requires the precision of machinery or years of honed skill. For simpler jobs, DIY cutting is not only the economical option, it’s also faster and easier. In this post, we’ll tell you how to cut closed-cell foam at home and get factory-quality results. 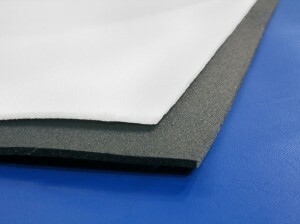 Closed-cell foam is unique, with a cellular structure that causes many materials to behave like fabric in thin sheets or like rubber in thicker sections. For these reasons, there are different cutting techniques based on foam type and the thickness of the material at hand. Before approaching the different types of foam cutting methods, we want to address the materials you will need. Unlike open-cell foam, closed-cell materials should be cut with a straight, non-serrated blade like a utility knife or a crafting knife. These knives work particularly well because their blades are disposable and easy to replace when dull. Scissors may also be used for informal projects, though they should only be used on certain foam types and thicknesses. It’s smart to have a guiding straight-edge as well. Lastly, always work on a surface that won’t be damaged by cutting. Neoprene is a rubbery foam, cross-linked polyethylene (XLPE) is slightly more “plasticy,” polyethylene roll is a thin, flexible material similar to XLPE, and gym rubber is spongy, but can be the softest or firmest material among these four types depending on formulation. Despite these differences, the physical structures on these materials remain similar enough to approach them in the same general fashion when it comes to cutting at home. When dealing with neoprene, gym rubber, XLPE, or polyethylene roll, the first thing you need to consider is the thickness of the material. If you’re working with sheets of material 1/8” or less, you may have the option of cutting with sharp scissors. Scissors are only suggested for small recreational projects like crafts because they can leave jagged edges on cuts where you need to open and close the blades more than once. If you’re making shapes for bath toys, or trimming tiny sections off a sheet for use in card making, scissors are a fast, effective method. PE roll is the easiest material out of these four to cut with scissors due to its flexibility. For projects that involve materials thicker than 1/8” and require precision, you will want to use a straight blade. You will need to consider thickness again, this time with it dictating how you should cut. If you’re cutting one of these foam types in a sheet 1/2″ or less, you should use the single-pass-through method, where you make one constant knife stroke that fully passes through the material you’re cutting. Using the single-pass method ensures the cleanest edges, as the blade only passes through once. However, on foam greater than 1/2″ thick, it is difficult to keep the blade moving through the material smoothly, which will turn into a sloppy cut. If you’re using the single-pass method on a thin sheet of foam, make sure your blade is sharp, as dull knives can snag once you get into the heart of the material. To make single-pass cuts, make sure the foam is anchored where you will begin your cut to prevent the material from puckering out from pressure. The best way to avoid this is placing a straight edge along your cutting line and applying pressure as you make your cut. Enter the foam from an outside edge and do not stop cutting once you have begun for the smoothest outer edges. For closed-cell foam thicker than 1/2″, it becomes difficult to move a blade through the material in a single pass. This can result in snags, or having to force the blade rather than letting its sharpness slice through the material. To cut a thicker piece of foam, the multiple-pass cutting method will get the job done well. Having a flat straight-edge that runs the full length of your cut is the most important aspect of this cutting strategy, as you will need to follow the line as you make multiple slices through the foam and don’t want the material to shift. Once your cutting line is established and your straight edge in place, begin your cut just the way you did with the single-pass method. Instead of plunging the blade all the way through the foam though, only cut about 1/8″ to 1/4″ of the way through the foam; just enough depth to keep the blade moving without force. It is also very important that you make each shallow cut the entire length of the foam. Make full passes through the sheet along your straight-edge, cutting deeper each pass through. Continue these shallow cuts along the straight edge until you have made your way through the sheet. One of the most commonly used closed-cell foams, polyethylene has a broad range of densities which affects the cell size, firmness, and flexibility of the material. In its lowest densities, it has an inconsistent, bubbly cell structure, which can affect how clean a cutting edge is. Because of this, we suggest not using scissors when cutting polyethylene. Follow the steps for single-pass cutting on sheets thicker than 1/2″ and for thicker pieces of polyethylene foam, use the multi-cut method. NOTE: These cutting instructions exclude expanded polystyrene (EPS), which is most efficiently cut with special hot wire cutters. It sounds like we can machine cut this for you. Please contact us for details. 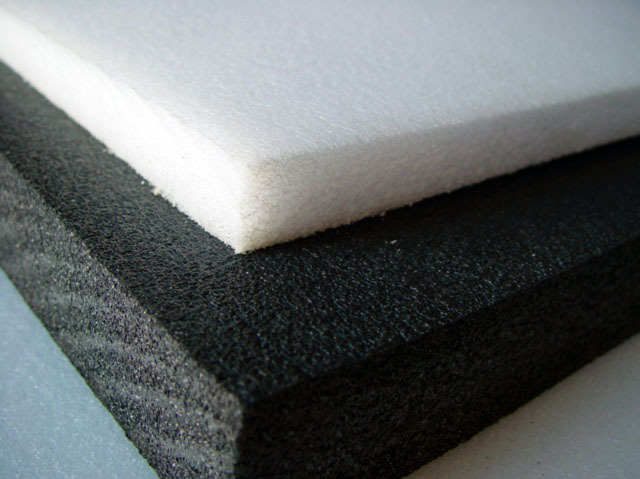 What would be the best method to cut clean holes in 3/4″ closed foam material? We would suggest a round die and a punch press. Otherwise, we could cut that with our waterjet cutting services. Contact us for more details. A hot knife will not work. However, you may try to carve the foam with a sharp carving knife. Hello, I’m using a kitchen knife to cut into 2 1/2″ thick foam and in result, I’m having trouble making accurate cuts and cutting out the right shape. Is there anyway I can contact you guys to make the custom cutouts in the foam instead? Or perhaps is there a a specific blade or item I can purchase to make cutting easier and more accurate? Most foams can be cut with a sharp carving knife or electric knife. Otherwise, if you contact us, we can do the custom cutting for you. Can open cell charcoal firm foam be safely cut with a hot wire cutter? No it cannot be cut with a hot wire. Foam must be cut with a sharp carving knife or electric osculating knife. Someone asked a questions earlier if you could you use a hot knife to shape neoprene and I would like to know if you can cut achieve a clean straight cut on Cross-Linked Polyethylene (Closed cell) using a hot knife tool if you use a guide. Or is it the same answer as above, whereas you can use a hot knife or hot wire for both open and closed cell. Would a non-serrated saw blade work. Hot wire can only be used with polystyrene foam and polypropylene foam. 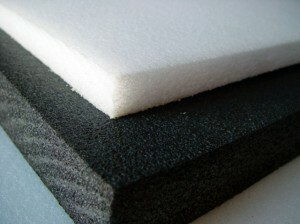 It will not work with all other foam products, including neoprene and cross linked polyethylene foam. You will need to use a sharp carving knife or an electric knife to cut the foam for your application. A non-serrated saw blade should work, but test it out first. I have attempted to have shapes cut through closed cell polyethylene foam by using a lazier. The lazier is having difficulty cutting through 1.50 material. The shapes are well defined as they are cut to a depth of an inch. If I sent you the material would be able to complete the outlines. If so how are charges estimated is it by inch or another method. I could send a picture of the items drawn to scale on graph paper for an estimate if feasible. We may be able to waterjet cut this job for you. Please contact us for details and pricing. Could I use one of these methods be used to cut a foam roller ? A cylinder would be difficult to cut with common tools. We do however have foam rollers available for purchase. Link to the foam rollers is here. I’ve been ordering your 1″ Firm Charcoal Open Cell foam for a couple of years for my business and have been very happy with your product quality and service. I use the foam to package my art pieces for shipping. The art work is made of wood and I’ve been cutting the foam by hand. I would like to get a higher quality fit and have been thinking about cutting the foam with my CNC machine and would like some advice. What kind of bit, rotation speed, and feed rate do you use? What do you use to hold the foam firmly in place? I have a 4’x4′ CNC with a vacuum table and hold down clamps around the perimeter. As far as we know the polyurethane foams such as the charcoal firm foam cannot be routed. We can however waterjet cut the foam to your specifications. Please contact us for more details. What type of foam is this considered to be? Thanks much! The picture looks like EVA foam or cross-linked polyethylene foam. Both foams are similar. Link to our cross-linked polyethylene foam is here. We can custom cut the foam down to the shape that you need. Contact us for more information. I need about 120 swords cut from polyethylene foam 1 1/2″ thick X 48″ X 108″ white. the swords are a simple design 37″ long with a T handle. I can provide you a drawing. Can you do these cuts? Yes, we can cut this for you. Please contact us for details and pricing.